Last week I reviewed the Quadrilateral Tee, and because life has a way to getting in the way of blogging (imagine that! 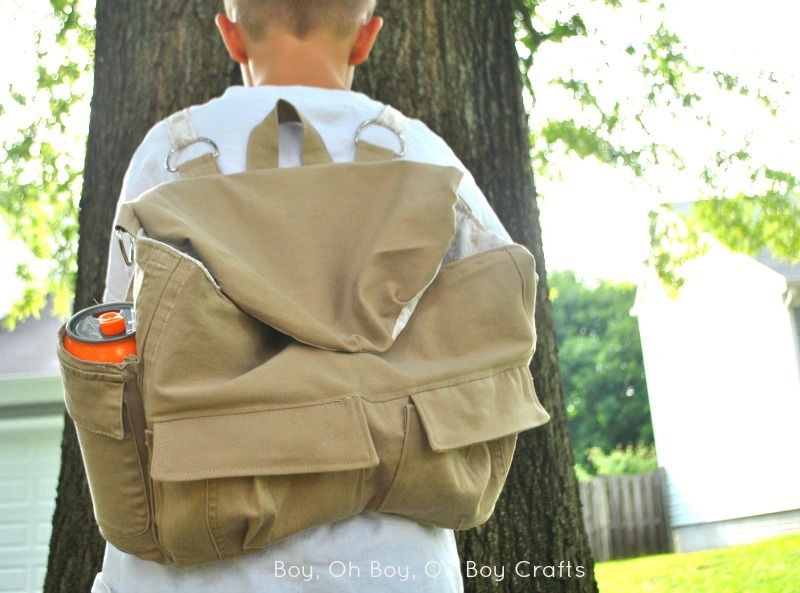 ), but I’m back with the Looseleaf Backpack from Mama Quail Patterns and the S Is For Sewing E-book just released from Sewing With Boys. 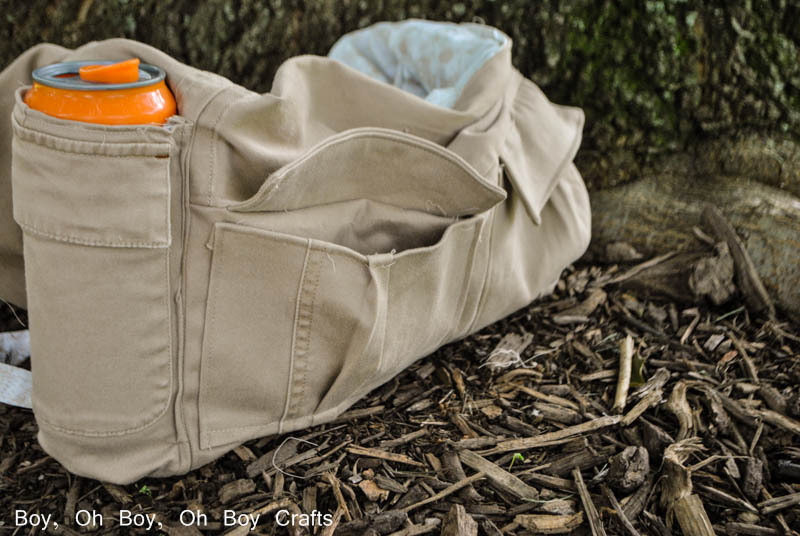 I used a old pair of maternity khaki’s for the outer fabric and chose the medium sized knapsack, cargo pockets and the no closure option. It was really fun to sew, but as a warning, make sure you have time to sit down to sew or spread this puppy out along a few days sewing time because there are A LOT of pieces and top-stitching so this is not a quick sew. I also highly recommend for sanity’s sake, that you create pattern pieces from the cutting chart measurements. Since this pattern is included in an e-book, the designer saved paper by creating a cutting chart instead of pattern pieces except the main pieces and since there are so many small and similarly sized pieces, this got a bit confusing at times. I know I like to have a pattern piece for each piece I’m working on so really this was my own fault. If you know you need a paper piece to keep yourself organized, take the time to make and label them. 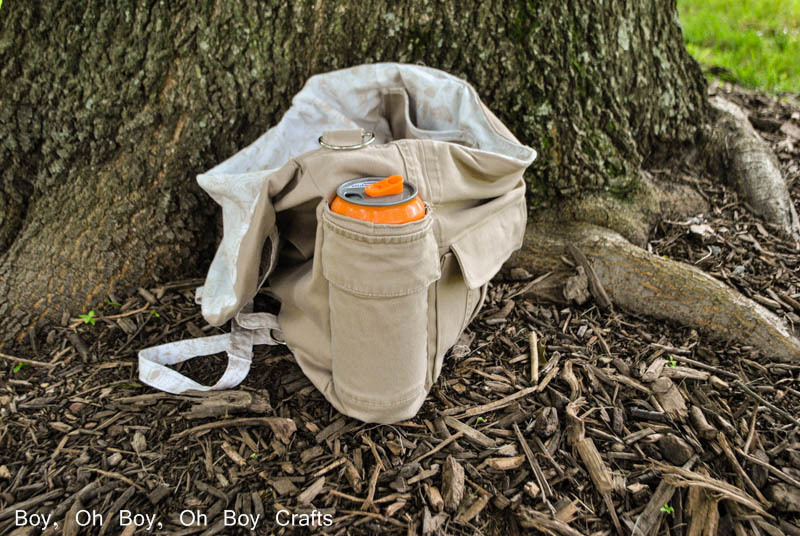 I reused one of the pre-existing pockets for the water bottle pocket which means when it’s not in it’s intended use, We’ve got an extra flap enclosed pocket. I couldn’t seem to get a decent photo of the back pack style straps but I made them a bit more permanent due to a lack of swivel claps at our local fabric store. I’ve got them ordered and plan to insert the removable claps later for more strap options. 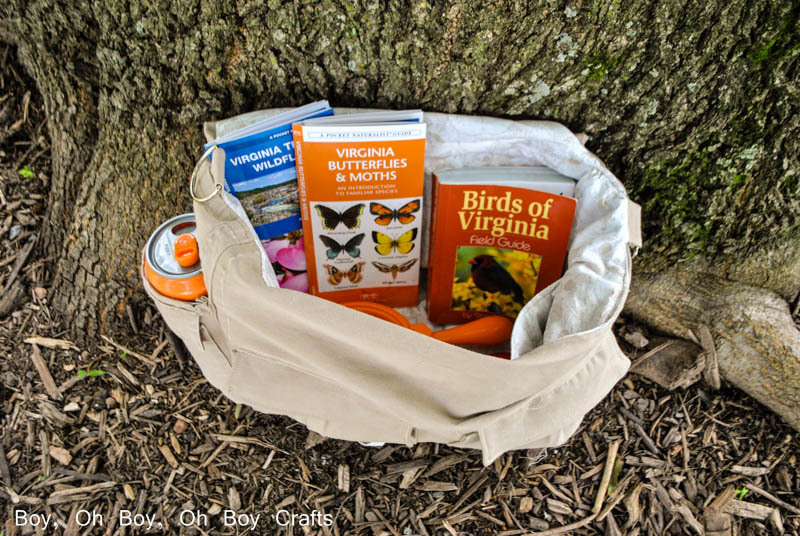 We love going on wooded walks and short hikes and this bag is perfect for carrying all of our “nature hunt supplies” as well as snacks and a drink to keep us fortified. I love that the front pockets have flaps for keeping all the little treasures we find along the way. The strap and d-ring loops were really fun to put together. As you can see from this photo, the outer flap could have used a bit of interfacing. It’s not recommended in the pattern because it caused the flap to be stiff but without the drawstring closure, it makes it hard for the magnetic closure to get a good grip. 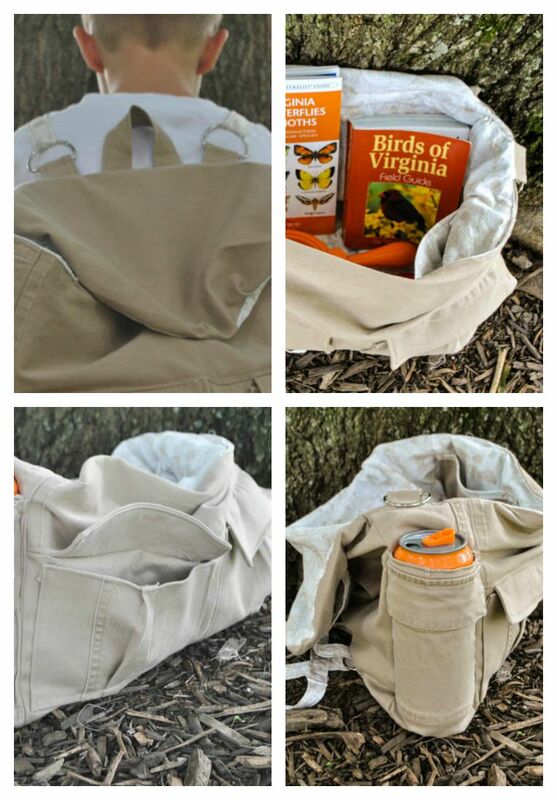 Other than that, I’m really happy with how it turned out and think it will make the perfect bag for our weekly nature walks. 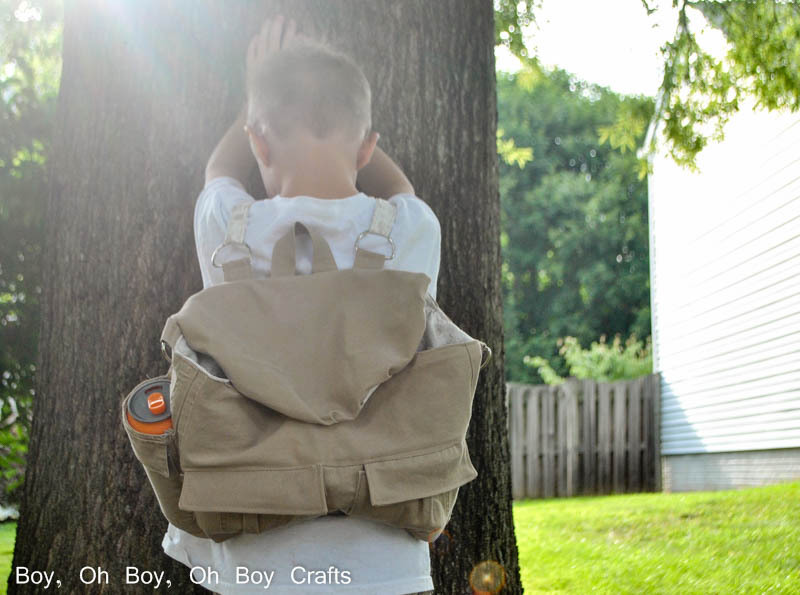 You can grab your copy of the e-book in the Sewing For Boys Etsy store HERE. That is 4 full PDF sewing patterns and a ton of extras for less than $17.00 which comes out to less than $5 a pattern.